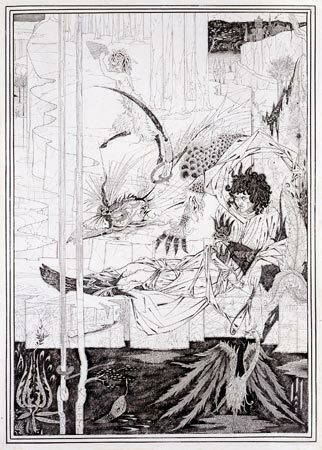 "Beardsley's illustration How King Arthur Saw the Questing Beast was commissioned by the publisher J.M. Dent for Thomas Malory's Mort d'Arthur, a late medieval story of magic, romance and sparring dynasties. Its decorative detail and flat surface effect were inspired by Japanese prints. Burne-Jones was appalled by Beardsley's drawings, which appeared virtually to parody the Pre-Raphaelite style. The Aesthetic creed of 'art for art's sake' made both the style and subject-matter of Victorian romanticism appear increasingly old-fashioned. A dwindling band of adherents lingered until after the First World War. 'Pre-Raphaelite in influence without being precisely Pre-Raphaelite in spirit…he disliked the Impressionists and Post-Impressionists almost equally; and was, naturally, even more opposed to later trends like Cubism, or the works of the Surrealists…his painting, in its own direction, represented the farthest extremity of Mr Deacon's romanticism, and I suppose it could be argued that upon such debris of classical imagery the foundations of at least certain specific elements of 20th-century art came to be built. At the same time lack of almost all imaginative quality in Mr. Deacon's painting resulted, finally, in a product that suggested not "romance" - far less "classicism" as some immensely humdrum pattern of everyday life'. *"
* A. Powell, A Buyer's Market, London 1952, pp. 2, 4-5, 9.